You asked, we listened! 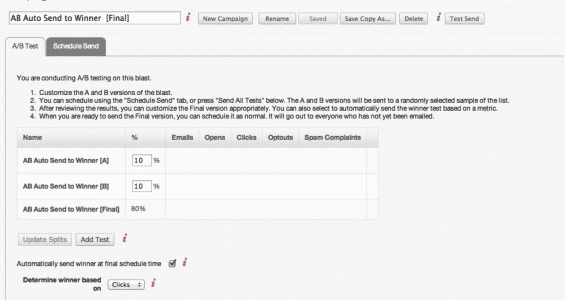 Today we released the much-anticipated A/B auto send to winner functionality to the Sailthru Campaign Interface. This feature is an automation game-changer, even though the premise is extremely simple. 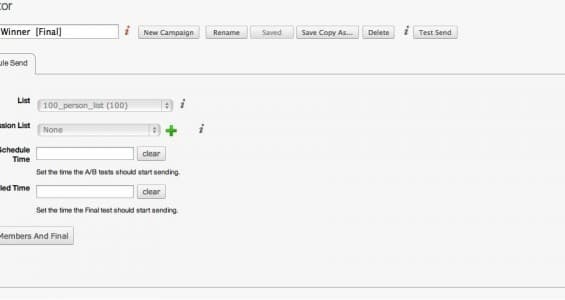 Once enabled, you will be able to automatically dispatch the final version of an A/B test campaign — eliminating the need to come back to your Sailthru dashboard to check on how your A/B tests performed. Now you can set up your entire A/B testing environment ahead of time. Select which metric you want to determine as your qualifier for a winner, either the highest number of unique clicks or unique opens to the A/B test segments. When set, the users remaining in the final A/B bucket will be automatically sent the winning version. First you will need to contact your Account Manager to get started. Once enabled, you can setup your A/B campaigns as you normally would and then select the checkbox “Automatically send winner at final schedule time” to choose the winning criteria (opens or clicks). When this is set up in your A/B test tab, be sure to schedule your test segments, and designate a send time for the final auto winner. Keep your product feedback coming, we love taking these smart ideas to create the features that will make the biggest impact on our clients. But we’re not going to lie, we also have a sweet spot in our hearts for some data-informed decisions!